Here you will find what have we been up to and what can you look forward to next! 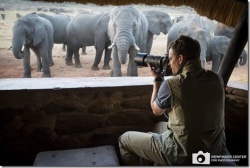 We invite you to join Matt and Dagmar Anderson of the Viewfinder Center for Photography, Winterthur, as they celebrate their recent success on a photography safari with Simply Africa and special guests to Zimbabwe and Botswana. They are hosting a special gallery evening at the Center on Friday, 5th September. They can’t wait to share their favourite photos with you. They’ll start opening the wine at 19.00 - bring friends and family who are curious about Africa and photography, and who would like to learn and exchange experiences! Join Simply Africa’s Stuart Danks and Viewfinder Center’s Matt Anderson for an unforgettable 10-day photography safari through the diverse and rugged landscape of western Zimbabwe. The trip takes you through the stone hills of the Matopos (the bald ones), and into vast Hwange National Park - a mecca for big game photography. And no trip to Zimbabwe would be complete without visiting the Victoria Falls - the largest waterfall in the world - so that is our third stop. Four well-appointed safari lodges will provide us with luxurious base camps and fantastic meals throughout our journey. This trip is a once-in-a-lifetime opportunity that you won't want to miss! You will have several opportunities throughout the week to download your images and receive direct feedback on composition and camera technique. Think of this workshop as equal parts African adventure, personal photography instruction, high-end accommodations - all within a friendly, small group atmosphere. Refreshing sundowners await you at the end of each day out! Stuart Danks - certified Professional Safari Guide who grew up in Zimbabwe, will use his local knowledge to make sure our group is in the right place at the right time, and keeps a close eye on our safety. On the southern leg of our trip we'll base out of the rustic, yet luxurious Camp Amalinda (two nights) as we explore the magical rock landscape of the Matopos National Park, do an early morning rhino walk, and visit the magnificent ‘World's View’, where the Right Honourable Cecil John Rhodes was laid to rest. If time allows, we'll visit the Silozwane cave, where ancient Bushman cave paintings decorate the granite walls. The middle leg of our trip is spent in Hwange National Park - Zimbabwe's largest game reserve and a wildlife mecca. Two of the following three luxury safari camps, Camp Hwange, Davison's Camp and Little Makalolo will serve as our basecamps (five nights), allowing us to explore and photograph from two different locations. Stuart will take us to his favorite waterholes where we can see big game such as elephant, giraffe, kudu, wildebeest, zebra, hippo, cats, and beautiful birdlife. The northern leg of our trip is equal parts enjoyment and relaxation. Based out of the luxurious yet vibrant Victoria Falls Safari Lodge (two nights), we'll visit the world's largest waterfall from the ground, and from the air too, if you wish. There's no better way to enjoy the Zambezi River than on a sunset cruise on the Zambezi Explorer. Do some gift shopping, visit the spa or simply relax and take in the landscape from the Safari Lodge's viewing deck - Matt's favourite place for laptop photo editing! 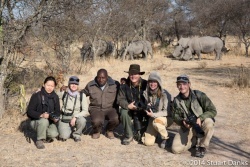 Safari 1:	Aug 17 - Aug 26, 2015, starts Bulawayo, ends Vic Falls. 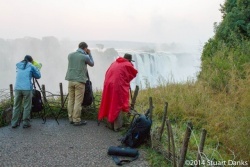 Safari 2:	Aug 29 - Sept 7, 2015 starts Vic Falls, ends Bulawayo. Accommodations: Camp Amalinda, Ivory Lodge, Camp Hwange, Davison's/Litte Makololo Camps, Victoria Falls Safari Lodge. Trip Format:	Fun and casual hands-on learning with the help of a professional photographer and experienced photography teacher. Experience Level: Open to all levels. Foundational photography skills such as those covered in Viewfinder's popular dSLR 1-2-3 Series for Beginners is recommended. Equipment: We recommend a digital SLR camera (and backup camera). Lenses covering wide angle to telephoto (preferably up to 300mm or 400mm), a laptop for downloading (optional), extra camera batteries, extra memory cards and a camera backpack to carry your gear. Group Size:	Minimum of 5 participants, maximum of 9. Trip Leaders:	Matt Anderson - Pro Photographer - and Stuart Danks - Pro Guide. 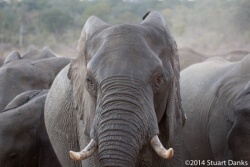 Safari Fee: USD7750 (double occupancy) or USD8550 (single occupancy). Fee includes 9 nights accommodation with meals, all guiding fees, photography tuition, transport costs and park entrance fees. Airfare to Zimbabwe, visas, beverages and spa visits are not included. A USD2000 deposit is required to hold your space. The remaining balance is due three months before your trip.